Getting tired of using the same old pedal distortion plugins? Want some more room to experiment? 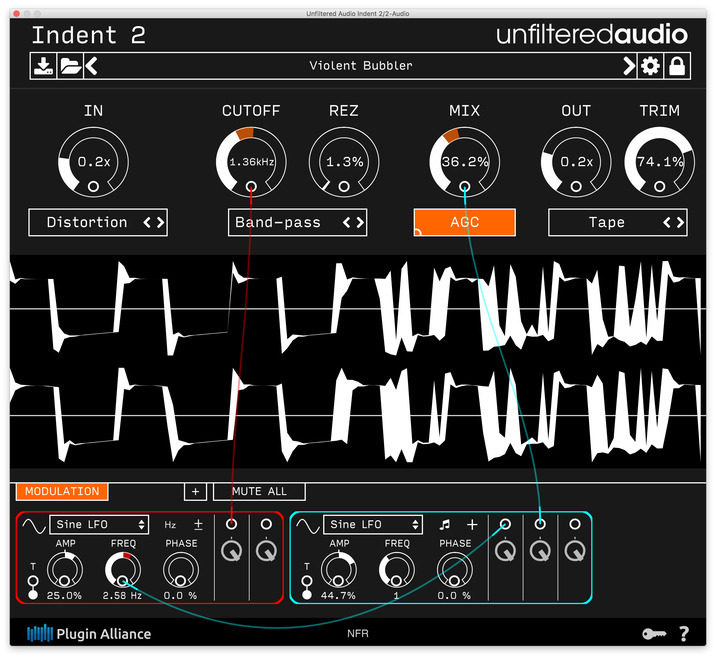 It’s time to get to know Indent 2, from Unfiltered Audio. With just a few adjustments, you can use this handy distortion toolkit to dial in just the right sound in seconds. But don’t be fooled by its simplicity; inside this small package is a highly versatile wave-shaping tool with no less than ten unique clipping algorithms. It’s like having a whole library of distortion plugins in one package. While Indent 2 will be right at home on your guitar tracks, it is much more than an overdrive pedal. You can drop it on just about any track or group to add a dash of subtle flavor, or to overwhelm your senses with a blast of delectable harmonics. Packed with such a range of different clipping styles, it can be your go-to plugin for finishing touches, experimental effects, and more. Indent 2’s signal path consists of a customizable multi-mode filter, sandwiched between two different clipping stages, both of which offer ten different user-selectable distortion modes: Hard Clip, Soft Clip, Wavefold, Overfold, Harsh Fold, Distortion, Tube, Tape, Gloubi, and Cubic. Including a filter in the plugin’s internal signal path dramatically expands its versatility, so it’s easily adaptable to a broad range of wave-shaping tasks. Add a modulated, resonant high-pass filter after the first clipping stage to get an old school techno sound on a synth bass track, then set the second clipping stage to “Wavefold” to smooth out the signal and add back some of the harmonics that were cut off by the filter. With a little experimenting, you’ll find that Indent 2 can imbue a nearly endless range of tones and emotions for any genre. Cranking up the gain with a “Wavefold” clipping style can be a great way to add an aggressive, punk rock tone to a vocal track, but dial back the gain and set the style to “Tube” and now your vocal tracks have a close-up, intimate feel that’s perfect for a ballad. Having trouble getting your synth bass to cut through in the mix? Try using “Soft Clip” along with a resonant high pass, and you’re in business. You’ll be amazed at how much the right kind of distortion can do for your mix. And here’s the best part: Almost all of Indent 2’s parameters can be modulated with Unfiltered Audio’s unique and intuitive modulation system. Just assign a parameter by using a virtual patch cable, and then select from among eight different modulators, including LFOs, a randomizer, and even a user-programmable step sequencer. Classic tempo-synced tremolo and wah wah effects are just the beginning. Modulate a drum’s input gain with an envelope follower to make stick hits explode and mic bleed shrink—or whittle the hits down to split-second spikes. Set the filter mode to Band Reject and modulate the frequency with a tempo-synced Sine LFO to get a Leslie effect on a guitar track; then apply the Step Sequencer to the Sine so that the Leslie pulsates with syncopated rhythms. That’s right – you can apply modulators to other modulators! Still not enough control for you? Check out one of Unfiltered Audio’s newest additions to their modulation section: The ROLI Lightpad modulator. Thanks to Unfiltered’s seamless integration with ROLI’s newest controller, you can use simple gestural controls to modulate Indent 2’s parameters in real time. Using the Lightpad’s unique three-dimensional interface, you can easily modulate multiple parameters, or even modulate other modulators. Apply the X and Y axes to the filter’s Cutoff and Resonance parameters to “draw” filter envelopes on the Lightpad’s surface, and use your finger pressure to control the resonance. Perfect for assembling a highly portable live setup. With Indent 2, the twist of a few knobs can create new and exciting sounds that keep your productions sounding fresh and contemporary. This is one small package that’s overflowing with tone.